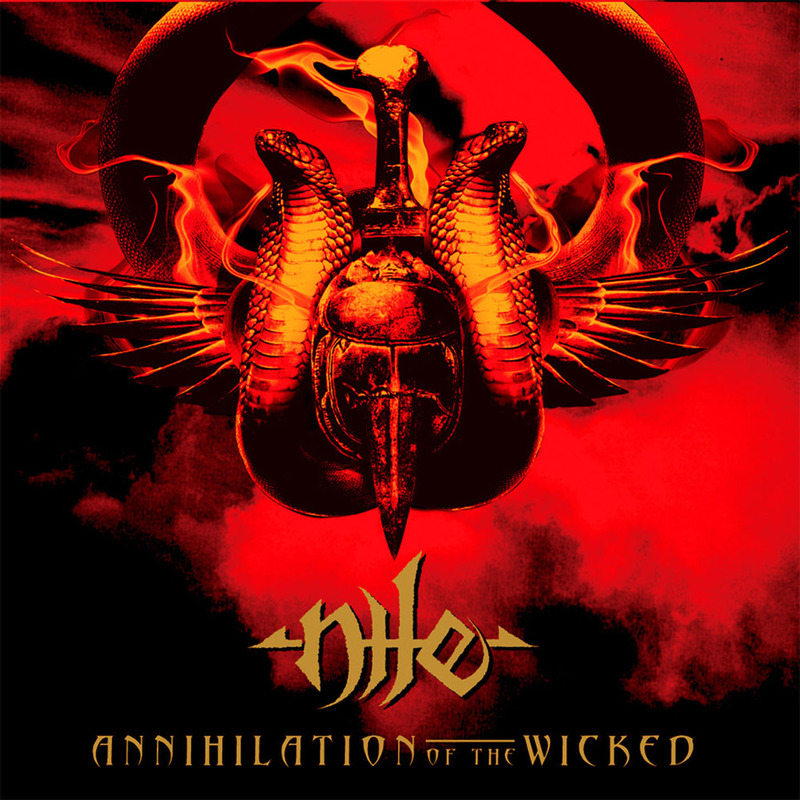 After the lukewarm “Annihilation Of the Wicked” Nile signed to Nuclear Blast Records. To say that the resultant album didn’t meet expectations would be an understatement. Whereas up to “In Their Darkened Shrines” the band had continually refined and honed its sound, here they are seemingly on autopilot. The previous album already toned down the Egyptian segues, but here they are virtually absent outside of the intro and the obligatory instrumental track. “Ithyphallic” is a lesser version of “Annihilation Of the Wicked” with all the shortcomings and defects that entails. Perfunctory would be an adequate descriptor for Nile’s Nuclear Blast debut - unremarkable would be another. The increased vocal presence of lead guitarist (and studio bass guitarist) Dallas Toler-Wade isn’t the single detriment to this record, but certainly its most audible. Sanders’ indecipherably low grunt is heard only far and few times, the revered three-way vocal interaction of the past is traded in for a rather bland and stock vocal performance by lead guitarist Dallas Toler-Wade that is similar to George Fisher era Cannibal Corpse. It was apparent that after five albums the Nile sound was losing steam. Consistent to a fault this is the first of their records to reek of process and sound formulaic. That isn’t to say that “Ithyphallic” is actively bad, it just is too rigorous in its adherence to the established Nile sound, and the lack of atmospheric segues and Egyptian interludes only exposes that critical weakness further. Despite appearances “Ithyphallic” is actually a worthwhile record, but far from Nile’s best, and not exactly its most inspired sounding. It is here that Nile starts its tendency to stretch out its song material for longer than is necessary, or wanted. ‘What Can Be Safely Written’ is in essence a 4-5 minutes long that is needlessly stretched out to almost 9 minutes. The song has a few memorable slow breaks, and the leads/solos are among the better in the band’s catalogue – but even then, the song is just too long for its own good. Thankfully it is only one of two instances wherein this happens. It would only become truly problematic on the successor to this record. The record stays enjoyable until the arrival of the dull mid-album dirge ‘Eat Of the Dead’, which is far from a return to the eerie death/doom trudge of the classic ‘Sarcophagus’. It is also the first track to have vocal contributions from founder Karl Sanders. What that track lacked in personality and power ‘Laying Fire Upon Apep’ has in spades, and its short running time works wonders for its effectiveness. Only the instrumental track ‘The Infinity Of Stone’ stands out because of how different it is from past instrumentals with its acoustic guitars and ethnic percussion. ‘Even the Gods Must Die’ is a gargantuan composition in tradition of ‘Unas, Slayer Of the Gods’ – and its opening is one of the better pieces the band has penned over the years, even though the song doesn’t live up to its monumental opening. While a lesser Nile is still better than most at their prime none of the material is really exceptional in any meaningful way. The cards are stacked against “Ithyphallic” in a number of departments, most notably the artwork. We are far way from the wonderful Wes Benscoter artwork of the preceding records. “Ithyphallic” has artwork from Davide Nadalin, and it is grainy, dark and flat out ugly. It is a defect that much of the latter-day Seth Siro Anton works also suffer from. It is a mystery how he was able to commission any more of his work after this debacle. Imagine what this record could have looked like had it been graced by one of the canvasses of renowned artists Andreas Marschall, Jean Pascal Fournier, Mariusz Gandzel, Jowita Kamińska or Uwe Jarling – or one of contemporary digital artists of the day like Anthony Clarkson, Björn Gooßes, Jacek Wiśniewski, Matthias Norén, Dave McKean or George Prasinis. Coupled with the formulaic approach to the songwriting and the abolition of the superb three-way vocal interaction that adorned its early era output it leaves the record a mere shell of what it ought to be, and should have been. No amount of soul-wrenching solos, ethnic instrumentation and percussive propulsion can hide that this band had written far stronger material in the not too distant past. The record continues the stagnation that first surfaced on the so-so “Annihilation Of the Wicked”. It is reliable and sturdy, but it doesn’t possess the compositional scope, the zest and the sheer hunger and aspiration to greatness that made predecessors “In Their Darkened Shrines” and “Black Seeds Of Vengeance” so memorable in the long run. The album is all about efficiency, and just like the typical intro is merged into the first song, there was no bass guitarist present for these recordings. Instead Sanders and Toler-Wade shared bass guitar duties in the studio when the album was being recorded. The performances of each member is top notch, and the recording by Neil Kernon was the best Nile experienced up to that point. The session was engineered by long-time producer Bob Moore at Sound Lab in South Carolina, and Kernon ensures that the band lives up to its mammoth source of inspiration. Moore was only responsible for the drum tuning for these sessions. On the whole “Ithyphallic” lacks the songwriting character and vitality of any of the band’s preceding records. The flagrant mishandling of the lay-out is another strike against what should have been a favorable big label debut. “Ithyphallic” is a mixed bag in terms of songwriting, and while it was the most pristine and professionally produced of Nile’s records up to that point, it was also its most generic. With their reputation established, a more or less stable line-up and the praise of the international metal press South Carolina band Nile had become comfortable within the little niche they had carved out for themselves over the years. With fans starting to salivate uncontrollably at the mere mention of a new recording, there was no incentive to push their sound into darker, more challenging territory. Never the great innovators, they enrolled Greek drummer George Kollias and Jon Vesano was reduced to studio musician status in order for him to combine his employment with being part of Nile. As a result this is Vesano’s last recording, although he would be involved on a session basis for later recordings. “Annihilation Of the Wicked” was the first Nile album to not bring anything substantially new to the table. After three records of carving out and redefining their core sound, the band was now perfectly content where they were at their current musical destination. So how exactly does “Annihilation Of the Wicked” sound? As a stripped down version of “In Their Darkened Shrines” more than anything, really – its angrier, faster and more drum-oriented, but nothing more than that. One of the great things about Nile is that they never lost a beat in replacing a member, no matter how well-loved or vital. Jon Vesano became a glorified studio musician, and Tony Laureano was duly replaced by Greek drummer George Kollias without any sort of hesitation on the band’s part. Kollias’ debut with the band is seamless, and while he has a wildy different style of drumming than Laureano, Roddy or Hammoura – he at least attempts to make the transition as painless as possible. The thing is that Kollias has a very busy sounding fill-oriented style, whereas Hammoura was more ‘open’ in his playing and Laureano had a more ‘circular’ style in the sense that he used every part of his kit at the most opportune of times. In terms of speed and intensity Kollias is at a similar level of skill as his illustrious mercenary predecessors. It also helps that the drum production is absolutely massive, and every part of his kit sounds stellar. Another thing that is record is known for its minimal usage of ethnic instrumentation, monk chants and atmospheric interludes. Outside of the acoustic guitar intro, there’s only the instrumental track ‘Spawn Of Uamenti’ which tallies a grand total of 2 minutes combined out of a 52-minute album. It is as if Nile wanted to prove how brutal and technical they could be after the tour-de-force that was “In Their Darkened Shrines”. There are three signature tracks on this record, and they are mostly in the style of the band’s newfound appreciation for primal brutality than they are atmospheric. ‘Cast Down the Heretic’, ‘Lashed To the Slave Stick’ and ‘Sacrifice Unto Sebek’ are faster, heavier and more technical interpretations of their debut album’s basic sound all those years prior. No really, “Annihilation Of the Wicked” is the album “Among the Catacombs Of Nephren-Ka” always wanted to be, but couldn’t due to any number of contributing human factors. One cannot fault the band for that, as even the simplest of material of “Among…” took an unreal amount of talent, skill and discipline to master – the fact that “Annihilation Of the Wicked” is all that, but more technical, faster and demanding on all fronts is nothing short of awe-inspiring in terms of the musicians involved. That this would be the last worthwhile Nile record makes it even more bittersweet in retrospect. Much of the writing style is similar to “In Their Darkened Shrines” with the difference that the band isn’t afraid to slow down every once in a while. The three-way vocal interplay is better organized than on the preceding record. Most of the vocals are split between Vesano and Toler-Wade with Sanders only sparsely contributing. The riffing is slightly more melodic, while the riff construction and note placement has evolved little since the record that became before. The bass playing mostly doubles the riffs, whether this can be contributed to Vesano’s studio-only involvement, or the writing on part of Sanders is something I’ll leave in the middle. Truthfully, the bass guitar lines were far more interesting in the records before this one. Here they mean nothing, and their contribution only seems to be that of bottom-end heaviness, but nothing beyond that. There is a greater emphasis on lead/solo work with this album, which is a welcome improvement on all fronts. “In Their Darkened Shrines” already hinted upon such evolution and it is great to see it fully realized here. Whether it is Toler-Wade or Sanders delivering the leads/solos, they are sparkly and lively. Not that both of them ever reach Schuldiner, Suzuki, Santolla or Azagthoth-like levels of composition or excess, they are at least playing solos – and in a scene where that practice was rapidly becoming a lost art, such a thing has to be applauded. You could say that this album sounds far more Californian on a number of levels. The blasting and riffing tends to remind of early Deeds Of Flesh and Decrepit Birth, especially the latter that was rising to higher levels of prominence around the release of this record. Thankfully, Nile is far more musical than the average Californian death metal band. They were on this particular record, at any rate. There isn’t the same sense of cohesion and unity on this record as there was on “In Their Darkened Shrines”, and that kind of takes the effect down in any number of ways. 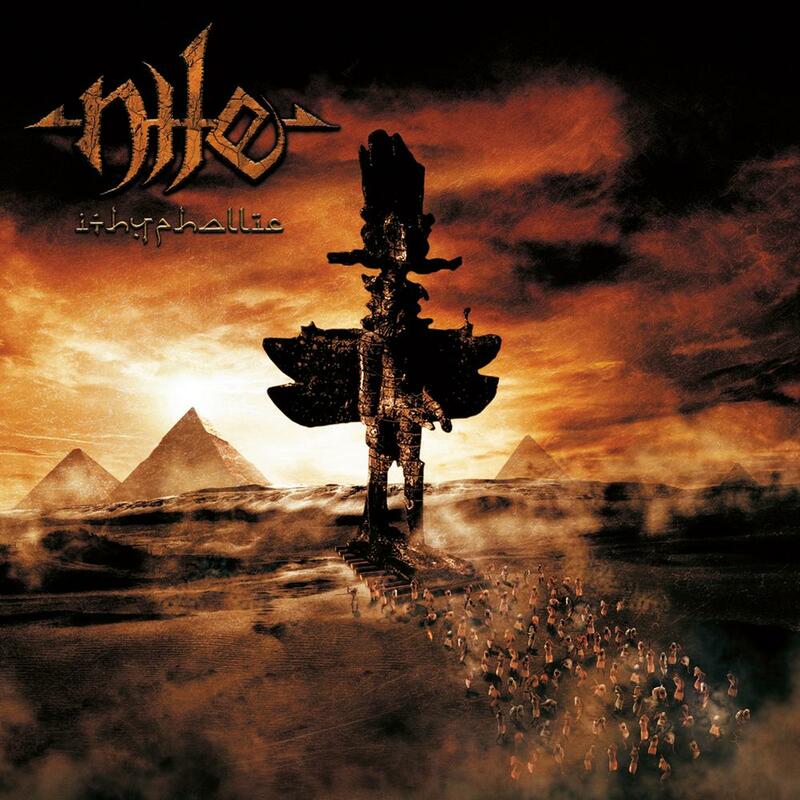 At times it is even hard to tell where one song stops and the other one begins, but that is more of an ill of contemporary death metal than it is of Nile’s own undoing. This would also be the last Nile record to remotely look good, because after this the band worked with a succession of lesser known cover artists that were hit-and-miss, to say the least. The most obvious offender in that regard is the direct follow-up to this record: “Ithyphallic” and the recently released “At the Gates Of Sethu”, which is equally as ugly in terms of cover art. Those albums unfortunate choices of cover art is nothing but a stark reminder that even big-budget, fully professional and international touring death metal acts can screw up as royally as their inexperienced underground peers. For the third time Wes Benscoter provided the artwork, while the design and lay-out was handled by Relapse in-house artist Orion Landau. The production by Bob Moore at Sound Lab in South Carolina is largely similar to the one of “In Their Darkened Shrines” with the biggest differences being the far cleaner guitar tone, and the absolutely massive sounding drums of new recruit George Kollias. The album is perfunctory and reliable, but misses the highlights of the preceding record. ‘Cast Down the Heretic’, ‘Lashed To the Slave Stick’ and ‘Sacrifice Unto Sebek’ (for which the band shot a promotional video) are the songs that instantly stand out, and along with ‘Burning Pits Of the Duat’ they embody everything worthwhile about this release. It isn’t Nile’s best, it certainly wasn’t their worst – but expectations were only partially met. Still, at this point the band and this release were still head and shoulders above their many competitors and copycats. “Annihilation Of the Wicked” is a solid, reliable record – but nothing more than that.